Baby is growing quickly. They need good nutrition and feeding abilities to grow big and strong. Baby will go through many stages of feeding development but they are all important to their growth. 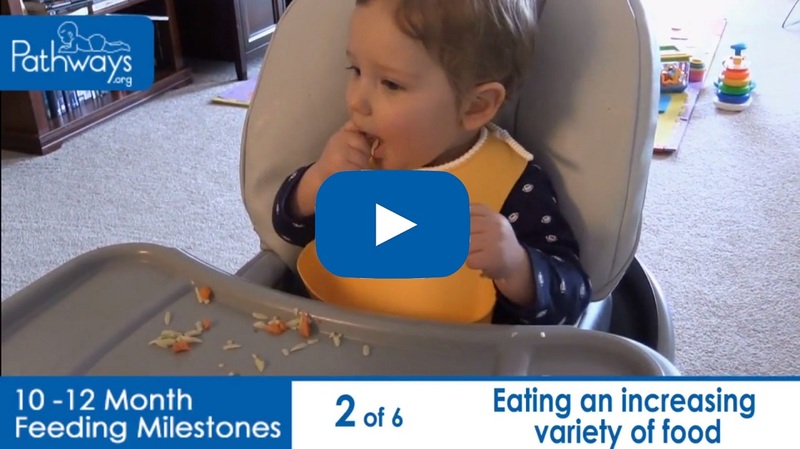 Baby needs to meet feeding milestones so they can chew and swallow safely as they grow up. Baby also needs certain motor skills in order to feed properly. At this stage, baby has very little neck and head control. They need to be supported while being fed milk or formula and they cannot digest any other types of food. Have you tried Massage+ 30, 10, 5? This baby massage is based on over 30 years of research and can help improve baby’s eating habits. A supported sitter may keep one or both hands on the ground while sitting. They have a stronger core and more control over their neck and head movement, which is important for introducing solids. At 7-9 months baby can sit up without touching their hands to the ground. During this time, they might try more variety in the texture and types of food they eat. Baby may begin learning how to use utensils during mealtimes and can start using an open cup at this age. Spills are expected and it will take practice. Baby is fully walking and exploring everything at this age, including food! They should be able to eat most of the same foods as adults after 12 months and more easily use utensils. If you have concerns about your child’s feeding, please contact their healthcare provider.